Cover Reveal for THE EYE OF THE NORTH! Meeting your book’s jacket for the first time is a heady experience. People compare it to having a child, but it’s not 100% the same (and I should know…) When you meet your child, you’re bound to think it’s the most beautiful baby the world has ever known. There has never been a bonnier child. No eyes have ever been sparklier nor any nose more buttony, and so on. But with a book jacket? Well. You have no idea how it will look (unless you’ve been heavily involved, which is unlikely); you sometimes don’t know the artist or their work, and you wonder if they’ll be able to ‘get’ your vision (if that doesn’t sound too precious). You worry that they’ll draw your heroine all wrong, or that they’ll put her in a flouncy gown when the book very clearly states she wears a studded armour-plated suit at all times, or whatever. In my case, the artist (Jeff Nentrup, by the way – check him out, he’s aces) created a cover which was exactly like the one I wanted but which I would have had no chance of creating myself. It was precisely what I dreamed of in terms of layout, style and colouring. The lettering is amazing. It just smacks of professionalism, skill and – dare I say it? – a total cohesion of my vision and his for what the book is about. And all this, without me ever having had a conversation with, or even having met, Mr Nentrup. If he’s reading – *waves* – you’re awesome! In short, I was blown away. And now, without dragging this out any further, I present to you (tah-dah!) the cover for my book, The Eye of the North, which is forthcoming from Knopf Books for Young Readers in August 2017. Isn’t she a beaut? Thanks to you all for still being here, for bearing with me during the last few chaotic months, and for sharing this wonderful journey. The first place I shared the seeds of Emmeline and Thing’s story was on this blog, and now here we have the cover of their very own book. Life, sometimes, is an amazing and funny thing. I hope you like the cover! I’d love to hear your thoughts. Let me know! This entry was posted in Uncategorized and tagged book jacket, book jacket for The Eye of the North, cover reveal, Forthcoming MG releases, Jeff Nentrup, Knopf Books for Young Readers, Sinéad O'Hart, The Eye of the North on October 11, 2016 by SJ O'Hart. So, blogging means you get to meet lots of nice and interesting folks, people who share your interests or who, in some way, make your life a nicer place. I’ve been luckier than most in that I’ve met – in the sense of online and real life encounters – some of the best people in my life through blogging. One of these people is Canadian author Michelle Proulx, custodian of a great (and riff-tastically funny) blog. Today, she reveals the cover of her YA space opera novel, ‘Imminent Danger and How to Fly Straight Into It’ – and it’s a doozy. I’m delighted to be helping Michelle with the relaunch of her novel. She is republishing it herself after a dramatic (and, at times, unsatisfactory) experience with her previous publishing company (here’s a representative post which will give you a flavour of the whole stressful drama!) and I hope you’ll agree it’s a beautiful piece of work. 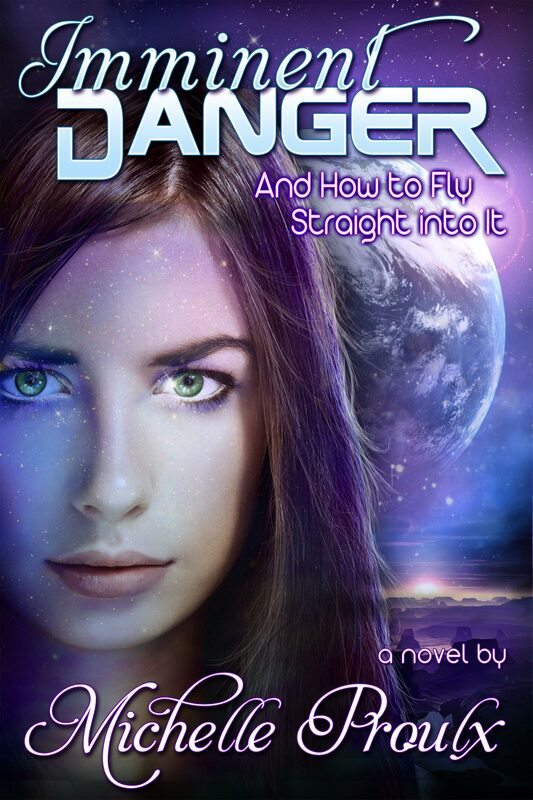 So, best wishes to Michelle, and welcome to the world, new-and-beautiful ‘Imminent Danger’! As they race across the galaxy, outrunning a villainous figure from Varrin’s past, Eris begins to realize that their relationship is putting her planet, her life, and her heart in imminent danger. She knows that trusting Varrin could prove deadly … but what other choice does she have? Michelle Proulx was born on the market moon of Vega Minor where she spent her formative years reading, writing, and gambling at illegal underground jsgarn fighting rings. While en route to Alpha Centauri, Michelle crash-landed her space yacht on the planet Earth. She now lives in Canada and divides her time between observing the local fauna and repairing her star ship. 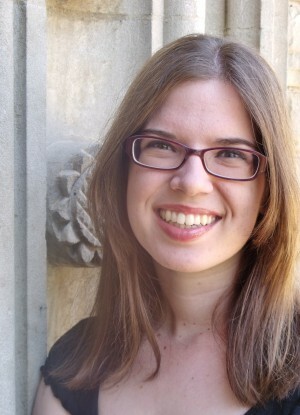 Author Michelle Proulx. Say hi! This entry was posted in Writing News and tagged cover reveal, Imminent Danger and How to Fly Straight Into It, Michelle Proulx, self-published novels, self-publishing, YA authors, YA novels on November 1, 2014 by SJ O'Hart.